The Young and the Restless (Y&R) spoilers for the next two weeks tease that suspicions will grow and bombs will drop. During the week of June 4-8, Sharon (Sharon Case) will wonder what’s up with Nikki (Melody Thomas Scott). She won’t get why a mama bear like her would be silent on the Victor (Eric Braeden) issue. After Victor sues Nick (Joshua Morrow) for full custody of Christian (Jude and Ozzy McGuigen), Nikki’s silence should become even weirder to Sharon. There must be a reason why she doesn’t intend to fight. The Young and the Restless spoilers say Nikki will face a blackmail threat this week, so that could be part of it. If Victor somehow found out the real J.T. (Thad Luckinbill) story, he’d have a way to keep Nikki quiet. Whatever the case, Victor has proven that he’ll do anything to get what he wants. It doesn’t matter how ruthless it is. Sharon will dump Nick in hopes of boosting his chances in court, but he may be no match for Victor’s power. Nick will need to think of a solid strategy ASAP! 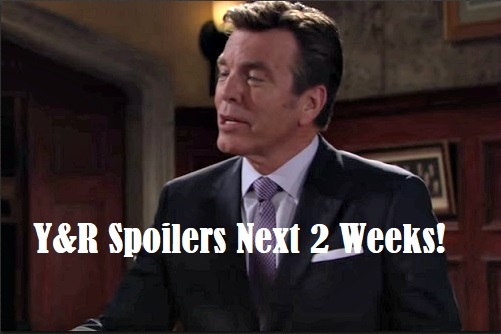 The week of June 11-15 will lead Jack (Peter Bergman) to a crucial choice. After getting more clues from Dina (Marla Adams), Jack may decide he has to know who his biological father is. Perhaps he’ll turn to some other sources for assistance. Brittany (Lauren Woodland) will also arrive in Genoa City to help someone out. She’ll offer her services as a lawyer, so this could involve representing Nick (Joshua Morrow) or Summer (Hunter King). The latter will get arrested the week before, so it’s possible she’ll need help getting out of a legal jam. Of course, Nick will be stuck with all the custody drama. He could definitely use a fantastic attorney. Elsewhere, Abby (Melissa Ordway) will get some valuable guidance from Lily (Christel Khalil). After hitting a rough patch with Arturo (Jason Canela), Abby may not be sure what to do. Lily’s been around the block a few times when it comes to forgiving and rebuilding trust. She might tell Abby that if there are genuine feelings, it’s worth the effort. Meanwhile, Y&R spoilers say Kyle (Michael Mealor) will come through for his family. He’ll pitch in on an Abbott problem, so he could start becoming part of the inner circle. Kyle wants to feel accepted and he might get his wish soon. Let’s just hope he doesn’t blow it! It looks like the next two weeks will deliver some great material. We’ll give you updates as other Y&R news comes in. Stay tuned to the CBS soap and don’t forget to check CDL often for the latest Young and the Restless spoilers, updates, and news. The Young and the Restless Spoilers: Victor Drops an Adam Bomb – Son’s Alive and Well, Uses Stunning News to Manipulate Nick?